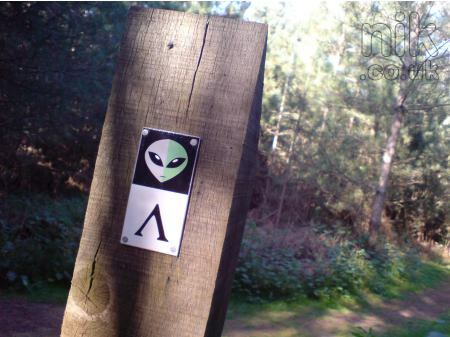 What is known today as the Rendlesham Forest UFO incident has been described as “the world’s first officially observed, and officially confirmed, UFO landing” – Britain’s equivalent of Roswell. And as the witnesses were all US Air Force personnel, their accounts have naturally been regarded as being highly reliable and credible. A thorough investigation of this case by British writer and astronomer Ian Ridpath began in 1983 and can be followed here. After three decades this controversial UFO mystery remains unresolved. As in the case of Roswell, the gulf between those who believe the UFOs seen at Rendlesham were an extraterrestrial spacecraft and those who feel the entire event can be explained in mundane terms continues to grow. In 2001 I persuaded the Ministry of Defence, using the Code of Practice for Access to Government Information (a precursor to the Freedom of Information Act), to release their file on the incident. My correspondence with the MoD, that led to the release, can be followed in the file DEFE 24/2030/1 and DEFE 24/2032/1 released by The National Archives in 2011. After I secured the release of the original documents, copies were later sent to Lord Hill-Norton, who passed them to Georgina Bruni, author of You Can’t Tell The People. Since that time I have, when time allowed, continued to trace key players in the saga including MoD and RAF personnel who dealt with the reports as part of their duties. Until 2010 Col Ted Conrad, one of the most senior USAF officers involved in the events, had kept his views to himself. Col Conrad was the RAF Bentwaters/Woodbridge base commander, and Lt Col Charles Halt was his deputy. Both men were subordinate to the Wing Commander, Col Gordon Williams, who played only a peripheral role in the events that unfolded. Until now Col Conrad’s only public comment was a brief interview given to journalist Eric Mishara, published by Omni magazine (Vol 5/6) in March 1983. At that time one of the more sensational rumours circulating on the base and on the UFO grapevine claimed that Conrad himself had spoken to aliens during the alleged UFO landing in the forest. In the Omni article Conrad denied he saw aliens but confirmed that he did conduct a brief investigation of the incident and visited the scene of the “landing” reported by Security Policeman Jim Penniston, whom he interviewed. I figured if anyone really knew what happened it would be Col Conrad as by his own statement he was responsible for the USAF investigation. So late in 2009 I contacted Col Conrad and asked him to go on record. It is apparent that Col Conrad’s recall of the precise chronology is slightly different from what has been established from the contemporaneous documents. Charles Halt’s famous memo to the Ministry of Defence, dated 13 January 1981, dated the sightings as 27 December and 29 December 1980. But contemporaneous documents show beyond any doubt that the first “sighting” of lights falling into the forest occurred shortly before 3 A.M. on Friday, 26 December. Halt’s expedition into the forest began late on the night of Saturday 27 December and ended in the early hours of Sunday, 28 December 1980. 0200 Halt begins reporting by radio 2nd set of sightings. No lights or objects seen by Woodbridge residents who were outside looking. Alerted SP’s at Bentwaters, but they saw nothing unusual. “The incident was discovered, investigated, reported and finished all during an eighteen-day period from 27 December…through 13 January 1981 [when Halt’s memo was sent to the Ministry of Defence]. Claims of more sightings at different places and later times are unrelated to the Christmas 1980 event. “All was normal for the [26 December 1980] security police [hereafter SP] night shift at Woodbridge until the very early hours. At that time the now famous lights were sighted on the ground in Rendlesham Forest. Three security SP’s were dispatched to investigate. They returned after more than an hour and went off duty at their shift change early that morning, at around 0700 [GMT]. “I can only speculate what went on in the SP squadron during the day [that followed, i.e. 26 December]. There must have been some concern over what to do about the sighting in terms of investigation and reporting. I believe the SP’s decided to keep everything low key, this being indicated by a change to the blotter entry concerning that early morning time frame. In any event, no notification or report was made to anyone above Major Malcolm Zickler, SP Squadron Commander, until late that evening. “Sometime between 2100 and 2200 on [26 December?] members of the Woodbridge SP shift appeared at a Christmas party at the O’Club where Lt Col Halt and myself were in attendance. They reported the events of the previous night and thinking there might be a recurrence, Halt decided to ride along with the shift leader, which he did. Aside from that, nothing unusual happened. “By the morning of [27 December 1980] I contacted Maj Zickler for information of the alleged sighting. His information was all second hand and sketchy. Those with first hand accounts were citing career concerns as justification for remaining silent. “Frankly at this point, Lt Col Halt and I were discussing what level of involvement was required from my office. We knew that silence would likely lead to allegation of cover up. With the rumor mill already operating it was a matter of time before the press got the story. We did not want the press to report the appearance of misinformation or cover up. We decided that a brief in-house investigation was in order. If we could find any credible evidence to justify a request for more high-tech investigators, then we would be in a position to pass the entire episode on to the British authorities. If any meaningful evidence were not found, we would document that fact and close the entire episode down by providing our facts to authorities in a low key manner. Events dictated the latter approach. Halt’s memo dated 13 January 1981. There is no mention in Halt’s report of UFOs projecting lights onto the Bentwaters WSA! “Lt Col Halt’s report of more lights both on the ground and in the sky brought quite a few people out of their houses at Woodbridge to see what was there. These people included myself, my wife, Lt Col Sawyer (the Director of Personnel), his wife, and several others listening to my radio and looking for the lights Halt was describing. Despite a sparkling, clear, cloudless, fogless night with a good field of view in all directions, we saw nothing that resembled Lt Col Halt’s descriptions either in the sky or on the ground. This episode ended in the early morning hours of [28 December 1980]. “One other significant thing happened on 28 December 1980. Maj Zickler finally convinced Sgt [James] Penniston to answer some questions for me. After a sincere guarantee that his report would have no ill effects on his career, Penniston reluctantly told his story. At the end of the session, I asked him to draw a picture of the object he had seen, which he did freehand. Jim Penniston is the only first-hand observer I was able to interview. We kept his name out of any of our correspondence to honour his request. “After all that, we found we had no hard evidence. In my judgement further investigation would likely gain us nothing but notoriety. We summed up what we had and Lt Col Halt composed a letter addressed to Wing Commander [Don] Moreland [the British Base Commander/RAF liaison officer, who was away on leave during the Christmas holiday], leaving it up to him if he thought it necessary to forward any of the information [to the MoD]. It was my intention to suggest that we would be happy if the whole thing died there. I can’t recall if I actually made this statement to [Wing Commander Moreland]. Col Williams was informed along the way and concurred with our plans and methods to wrap things up. Any information he may have passed up the chain of command was, to my knowledge, done verbally and informally. “As mentioned above, we had people in position to validate Halt’s narrative, but none of them could…On the OMNI article, I began by denying being present at the landing site while the UFO was on the ground. I also denied that I consorted with aliens or repaired their space ship etc as widely reported in the British Press. I recall that the reporter asked me if all that was true. My Omni interview began with those denials. I did visit the alleged [landing] site on the afternoon of 28 December 1980. The article states that I interviewed two eyewitnesses when in fact I only interviewed Penniston. They were correct to say that ours was the only investigation conducted, that I know of. “There were no conspiracies, no secret operation, no missile accident, and no harsh interrogations by OSI [Office of Special Investigations, USAF]. I was in a position to know about the OSI. It was a special organisation with a special mission. They had their own chain of command, but in practice the OSI commander kept me informed of any ongoing investigations they had. Someone reporting unexplained lights would not normally have been subject to OSI attention. They were after serious lawbreakers, including drug traffickers, security risk, and the like. “If I have any regrets, it is that I should have challenged Lt Col Halt’s account of the events on the night of 28 December. However since I wanted to avoid the appearance of shaping the story, I was reluctant to require any changes to his letter to Don Moreland [sent to MoD on 13 January 1981]. Also, I think maybe Don Moreland and I should have met over lunch one day to discuss a better way to handle the information in Halt’s letter. Halt’s letter gave us cover by putting Don on the spot. This left Don with the full burden of the letter and its disposition. When the letter was eventually released from MoD, it generated the frenzy of speculative reporting and the inevitable allegations of cover-up. [DC]: What is the source of the dating/chronology of the events set out in your letter? [Ted Conrad]: I believe the chronology…is the correct one. It is based on Halt’s letter and my own rather tenuous recollections of those days. If the known time line is respected, a shift of a day one way or the other shouldn’t matter much. Just to reiterate, if Penniston’s encounter on day 1 was at approximately 0300 hrs. the notification at the party was 18 hours later at approx. 9:00 PM, also on day 1. Penniston’s interview occurred the morning of day 2, and shortly there after we decided to investigate. Halt spent most of that day with the investigators, the starlight scope and Geiger counter. After sundown he went back to the forest with his tape recorder, and reported seeing lights that night. This was actually early morning of day 3 and approximately 48 hours after Penniston’s encounter. Take your pick for day 1,either 0300 26 Dec. or 27 Dec.
[Ted Conrad]: I wasn’t aware of any further statements made during that time frame. [Ted Conrad]: The comment “it’s back” was relayed to me by Lt. Col. Halt. I don’t know who told him that or why. There were no claimed sightings that night. The statement might have been simply an “attention getter”. [DC]: Why was no action taken to scramble aircraft during Halt’s expedition? [Ted Conrad]: No defensive action was taken or considered since no offensive action was noted. [DC]: Was any of the radio chatter from Halt’s team that you overheard recorded? [Ted Conrad]: None of Lt. Col. Halt’s radio comments were recorded to my knowledge. There were recordings made on an audio tape machine that he was carrying at the time. [DC]: Why did it take almost 3 weeks for you to report the incident to the MoD? I thought my previous narrative covered the timing of our report fairly well. It took us a few days to sum it all up and get it to Moreland’s office. I can’t speak for the timing after that. [DC]: In your letter you say you think the incident is “explainable”; what explanation do think might apply? [Ted Conrad]: The search for an explanation could go many places including the perpetration of a clever hoax. Natural phenomenon such as the very clear cold air having a theoretical ability to guide and reflect light across great distances or even the presence of an alien spacecraft. If someone had the time, money and technical resources to determine the exact cause of the reported Rendlesham Forest lights, I think it could be done. I also think the odds are way high against there being an ET spacecraft involved, and almost equally high against it being an intrusion of hostile earthly craft. [DC]: Why do you think the incident has been sensationalised? [Ted Conrad]: Dr. Clarke, I think you are best qualified to answer this question. There are many reasons for the exponential expansion of UFO stories. All media need news to sell. When news is short, more gets invented. People want to be important to the extent they help make up some news. [DC]: Col Halt is on record (2009) as saying the UFOs were ET craft and the event has been covered up by the US and UK governments etc, what’s your comment on that? [Ted Conrad]: Col Halt can believe as he wishes. I’ve already disputed to some degree what he reported. However, he should be ashamed and embarrassed by his allegation that his Country and England both conspired to deceive their citizens over this issue. He knows better. [DC]: Can you comment on the ground traces and alleged higher radiation readings detected in the forest? [Ted Conrad]: Sgt. Nevels, the Geiger counter operator, initially reported slightly elevated readings. after his first visit to the location. However on a subsequent verbal report, he gave the radiation levels as equal to the normal background “noise”. As a matter of fact any evidence at the alleged landing site (if any) was so unremarkable that some people eventually became unsure as to the exact landing site. [DC]: Did you or Col Williams write or submit any written report to USAFE HQ about the incident? [Ted Conrad]: To my knowledge, there was no written report sent forward from Bentwaters to USAF higher Headquarters. [DC]: Do you recall what Penniston told you and what became of his sketch? [Ted Conrad continues]: I asked [Penniston] for a description of the object. Penniston said he didn’t get close enough for a detailed look. What he saw was generally rectangular in shape and slightly larger than a jeep in size. The object was mostly obscured by two horizontal rows of very bright closely spaced lights, one row white, the other light blue. He thought one row ran along the top, the other row around the middle. Again his distance from the object and the brightness of the lights obscured any further detailed observance. I am aware this description is at variance with subsequent statements and drawing made by others. [DC] Were you aware that following a call from the security police at RAF Woodbridge, British police officers were called to the scene of the ‘landing’ in the forest? I also understand that officers from the Suffolk fire service were also called to the scene at one stage. [Ted Conrad] With regard to Suffolk Constabulary, the Suffolk Fire Service, I am certain none of these were called to respond to the Penniston experience. The response to RAF Woodbridge by any of these agencies would have been a major event implying laws had been broken or there were major fires to be put out. Remember, Penniston’s first statement other than conversations within CSA, wasn’t until more than 24 hours after the lights disappeared without a trace. This was too late for any response to Penniston’s sighting. One possible exception: I seem to recall we notified the Suffolk constabulary of our desire to visit the scene and asked their permission to do so and also extended an invitation to have a look for themselves. I believe Maj. Zickler made this call. To the best of my memory , two officers did show up that afternoon and seemed unimpressed with the forest location. I missed seeing them. They came and went before I arrived. (Source: a copy of the incident log was released by Suffolk Police under FOIA in 2005). Questions will no doubt be raised about Ted Conrad’s motivation for speaking out 30 years after the event. But readers should understand that he provided this information freely after I made the effort to write to him in 2009. I was encouraged to do so by one of the key witnesses (John Burroughs), who naturally wants to know the truth concerning the experience he underwent in Rendlesham forest. Col Conrad’s recollections, particularly with respect to the chronology, are not 100% reliable. He appears to be unaware, for example, of the fact that British police officers were called to the scene of the ‘landing’ by the Law Enforcement desk within minutes of airmen Burroughs and Penniston returning from the forest on 26 December 1980. However, his testimony concerning the events of 27/28 December stand in stark contrast to those of his deputy, Charles Halt. Conrad’s recall of Sgt Penniston’s account of his experience on the “first night” also directly contradicts his subsequent account of having approached and touched a landed object, which he was able to sketch and photograph. In turn Penniston’s account is inconsistent with that of his colleague John Burroughs, who says he only saw lights. At this stage it is instructive to examine how the USAF commanders at RAF Bentwaters/Woodbridge dealt with the aftermath of the incident. As officially the USAF had no interest in UFO sightings following the closure of Project Blue Book and the sightings took place outside the perimeter fence, Lt Col Halt was instructed to report them to the British authorities. Halt waited for the RAF base commander, Squadron Leader Don Moreland, to return from his Christmas holiday before making his move. It was Moreland who advised Halt to write the famous memo summarising the events which he sent with a covering note to the Ministry of Defence’s ‘UFO desk’ at Whitehall. We now know that Halt’s memo, titled “Unexplained Lights”, dated 13 January 1981, reached the UFO desk officer Simon Weeden almost three weeks after the sightings. Weeden immediately circulated details to a number of MoD branches and radar stations asking for their advice. The contents of these internal discussions first emerged in May 2001 when the contents of the Rendlesham file were released following my ‘Code of Practice’ request to the UFO desk. They reveal the Defence Intelligence Staff (DI55) were unable to explain the sightings but offered to follow up the radiation readings described by Halt. According to Weeden the RAF air defence staff who scrutinized Halt’s report remained “curious but skeptical”. The documents reveal their inquiries relied upon the incorrect dates supplied by Col Halt as the basis for their checks with air defence radars. But RAF UKADR logs revealed no evidence that any unusual radar tracks had been detected or reported during the entire Christmas period. As a result MoD decided that “US night-time military movements”, the beam from the Orfordness lighthouse or even lights used by poachers were more likely explanations than an alien landing. According to Moreland and Weeden these basic checks were the total extent of the MoD’s inquiries into the “unexplained lights” reported by USAF at RAF Woodbridge. They did not consider it necessary to contact Halt or his men directly, or request any additional information. However, two of the USAF witnesses, James Penniston and Charles Halt, have claimed that British officials were involved at the scene from an earlier stage. Penniston has gone further, claiming that officials from DS8 were physically present when he was interviewed by US Air Force intelligence officers. The DS8 desk officer at the time, Simon Weeden, spoke to me exclusively in 2005. He confirmed “that the letter from Squadron Leader Moreland was the first time the Ministry of Defence was made aware of the alleged incident in Rendlesham Forest”. The memo arrived on Weeden’s desk no earlier than 14 January 1981. Weeden also revealed that in 1980 DS8 staff were under instruction from MoD that it was “inappropriate” for desk officers to conduct interviews with UFO witnesses. This rule was also followed by the two other branches with an interest in UFOs, DI55 and RAF Air Defence (Ground Environment). These facts are consistent with the paper-trail that forms part of the MoD’s Rendlesham file, released in 2001. Nevertheless, within months of the incident in January 1981, rumours about a UFO landing at the base leaked out to civilian UFOlogists, along with a story that an unidentified object had been tracked by RAF radars. During 1982 when the protest against American Cruise missiles at RAF Greenham Common was underway, the MoD began to receive letters asking if the UFO story had been spread to conceal a military accident involving a missile or aircraft. Despite increasing pressure the MoD refused to discuss the contents of Halt’s report until 1983 when the contents his memo, released under the American FOIA, was splashed across the front page of The News of the World. By that time sensational stories had begun to emerge from USAF personnel who claimed they were present at a second UFO landing in the forest, when contact had taken place between the base commander (Col Conrad) and the occupants of the UFO. They claimed threats had been made against airmen who witnessed these events and a cover-up was underway. “[RAF] Neatishead, which is the Sector Ops Centre responsible for that area [Bentwaters/Woodbridge], had nothing unusual to report, and nothing more substantive has come to light. I have received no evidence that any radar reported unusual tracks.” (DEFE 24/1948/1). Badcock’s testimony was confirmed by Squadron Leader Derek Coumbe who was duty commander at RAF Watton, the air traffic control centre for the region, during the incident. When I spoke to him in 2001 he recalled receiving a call from the USAF at RAF Bentwaters whilst Lt Col Halt’s team were in the forest observing lights in the sky. “They were very jumpy and panicky on the phone…but I personally checked the radar picture and there was absolutely nothing to be seen. They kept coming back and implying there should be something but we kept a watch on it through the whole period and nothing was seen.” (personal communication 2005). “On the night of the reported sighting our controller on duty was requested to view the radar; nothing was observed. These facts are recorded in our logbook of that night.” (DEFE 24/1948/1). UA37 was the code for an air corridor used by civilian aircraft which ran north/south approximately 40 miles east of Bentwaters. FL370 signified “traffic” at 37,000 feet in altitude. 0325 GMT on 28 December is consistent with the timing of Lt Col Halt’s expedition into the forest during which he and other airmen observed lights in the sky. We now know that whatever these lights were, they were not detected on Air Defence radars. Neither could they be seen by Col Conrad, the base commander, from his vantage point at RAF Bentwaters which, according to his testimony, commanded a wide and clear view of the skies. Forester Vince Thurkettle – who lived in the forest at the time of the incident – also visited the landing site about six weeks later after hearing rumours about a UFO landing. He too was left unimpressed by what he saw. Thurkettle said the three depressions found by the USAF airmen in the clearing resembled holes produced by burrowing animals. And Thurkettle also swiftly identified the mysterious marks on nearby trees which Halt’s team appear to have attributed to damage caused by a UFO as the marks made by foresters’ axes to identify trees earmarked for felling. So what conclusions can be drawn about the UFO incident that is widely known today as Britain’s Roswell? 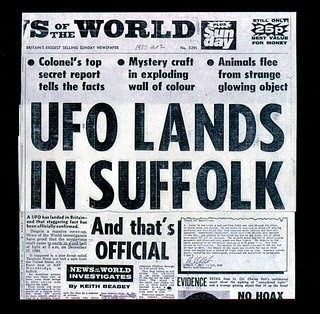 Can all the weird sightings really be explained by a fireball, the Orfordness lighthouse and bright stars as Ian Ridpath has concluded or did a genuine unidentified flying object visit Suffolk as the airmen continue to believe? What is clear from the official documents is the MoD’s early reluctance to reveal what little it knew about the UFO incidents allowed the mystery to grow and provided fuel for allegations of cover-ups. In fact it was two decades before the full contents of the MoD’s file on the Rendlesham incident were revealed. Early in 2001, with Britain’s own Freedom of Information Act pending, the MoD finally released the papers they held on the incident after I applied to see them. They did not contain the “smoking gun” anticipated by UFOlogists who had speculated about the contents for 20 years. Instead the file revealed a half-hearted investigation by disinterested officials. Most surprising of all, the papers revealed the MoD did not feel it was necessary to interview Halt or any of the airmen involved in the original sightings. As was the case with the original Roswell incident, there is a great difference between the few certain facts that can be established from contemporary records and the elaborate legend that has grown up around the Rendlesham UFOs. The legend has been nurtured by tabloid headlines and sensational TV documentaries and today is so well known that the Forestry Commission have set up a “UFO trail” in the forest for pilgrims who wish to relive the story in their imagination. As the decades pass attempts to separate fact from fiction become increasingly difficult. All that can be said with certainty is that it is unlikely we will ever know what really happened in Rendlesham forest in December 1980. Thanks to all those who have contributed to this research, particularly Ted Conrad, Don Moreland, Simon Weeden, Neil Colvin, Derek Coumbe, Ian Ridpath, Vince Thurkettle and Nick Pope. Special thanks must go to John Burroughs and John Rackham for encouragement and motivation. The contents of this paper are Copyright David Clarke 2011 (revised version 2017). Permission to use extracts is granted provided the source of the material is clearly acknowledged. Very nice work at trying very well to separate the noted “facts” from “fiction”. This should be filed under the “People Want to Believe” dept. As the above article says, there is a significant difference between the details recorded at the time and what is being peddled by some of those involved in the ‘incident’ today. The biggest problem I see with this story is Penistone’s account. Originally there was an oblong object with two rows of horizontal lights that was no closer than 50m away, then there was a triangular craft that Penistone actually touched. He commented somewhere that ‘it was warm to the touch’. Not only did he touch the object he was able to sketch some symbols that were on the side of it. This makes me think there’s nothing really interesting to the story, this has just been embellished for fun or for making money on the UFO talk circuit. Now we hear Penistone wrote down a lot of binary code at the time that he didn’t reveal for 30 years, and that when decoded refers to Hy Brazil. This nonsense has really driven the nails into the coffin of the Rendlesham story for me. Binary is of course a terrestrial language, what he wrote down might just as well have been in English. And, of course, why wait 30 years? It’s a shame but I don’t think there’s anything extra-terrestrial to the Rendlesham story at all. This pretty much summarises my own feelings about Rendlesham. But I doubt such valid critiques will put a halt (!) to the bandwagon driven by Pope, Penniston, et al, who are promising that all the skeptics will be proved wrong when they publish their book, no doubt followed by lucrative TV deal, lecture tour etc. I predict the new ‘revelations’ will prove nothing other than how easy it is to spin a yarn to those who literally ‘want to believe.’ It is modern folklore in the making. Rendlesham has become a money-making industry and, like Roswell, is too good a story to let go. Both ‘Sky Crash’, and ‘Left by East Gate’ are highly absorbing books but they smack of unscientifically produced information, fancifully produced for popular consumption. This is not to assert that nothing inexplicable occured in the Forest in late 1980. The Cash-Landrum Incident, which happened at almost exactly the same time, near Huffman, Texas, is far more credible since poor Betty Cash, and to a slightly extent, Vicki Landrum and her grandson Colby, physically suffered from their horrific Encounter of the Second Kind in Piney Forest. Rendlesham has too many inconsistencies, elements that don’t add up and a lack of genuine, lasting, tangible evidence. Conflicting accounts, personality issues, a failure to instigate immediate and early investigation, an unaccountably long gap between the events and their release into the public sphere, as well as vested interests compounded by seeming apathy at the official level have collectively made this incident less credible than perhaps it should have been. In the wake of the confusion, a strong case can be made for creating systematic policies of investigation and enquiry into all such unexplained phenomena in the future. Hi Richard – thanks for a thoughtful and incisive posting. I fully agree with everything you said, including the comments about the Cash/Landrum incident. What actually happened at Rendlesham is now, unfortunately, never likely to be resolved. As you say there are too many contradictory stories and vested interests involved. The opportunity to investigate was lost within the first few years…after 30 years the trail is completely cold. I like the idea of an agency that investigates stuff before the scent goes cold, but who is going to fund this? 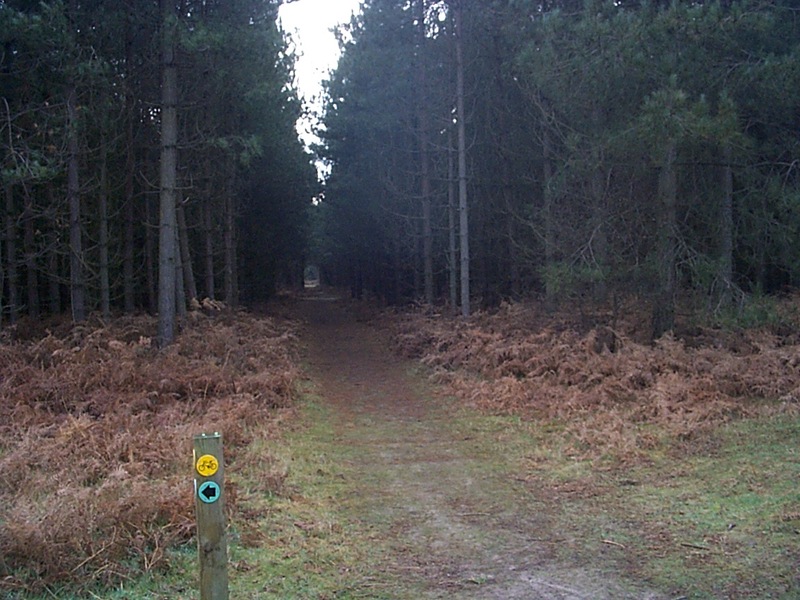 The creation and setting up of a panel whose remit would be the exploration and investigation of such incidents as the Rendlesham Forest mystery seems to be one answer. Such a group, numbering, say, between 15 and 25 people would be given the task of probing and ultimately pronouncing on the veracity of witness statements, authoritatively deciding as to whether an event did occur, collecting every connected fact, weighing up what evidence was available and then arriving at a culminating decision which would carry weight and influence. Members of this ‘Scientific Committee for the Investigation of Unexplained Aerial Phenomena’ (SCIUP), as it might provisionally be called, could be drawn from an assortment of discrete disciplinary fields: scientific, (astronomical, radiological, biological), geographic, legal, news media, journalism, the armed services, interested members of the public, and yes, the UFO lobby as well, and have the remit not of ascertaining as to whether an incident constituted a ‘defence threat’ to the country – as has been the predominant theme of the Ministry of Defence – but of helping to advance the cause of dispassionate enquiry within the aim of promoting scientific advance in understanding extreme and rare phenomena. A barrister should be included and a sociologist: the sociology of ufological belief is still an undeveloped area. I can predict that were such a group be set up, it would either have very little to do whilst forlornly waiting for the next ‘Rendlesham’ to occur, or, conversely, be rushed off its feet as it tears to each new reported site in response to the latest ‘UFO sighting’ claimed by over-zealous ufologists! The composition of such a committee would require a great deal of thought and care, not in terms of who was to sit on it, but over the relationships and intersections between potentially competing interests, academic perspectives, agendas and viewpoints. However I believe it could be done, although it would be very difficult to achieve absolute neutrality in such a collection of diverse members; scientific truth, whilst masquerading as ‘truth’ sometimes isn’t; vested interests would still be obstinately present. But the group would speak as one voice, it would, as it were, ‘clear the air’, people would wait for it to pronounce, to give its verdict. This final judgement could be delayed in certain cases and even never arrived at when overwhelming doubt persisted over a case. Mind you, all this mighty academic weight and influence could take the fun out of it all. But at least an established committee could do something to set the balance straight and act as a corrective against the vagueries of rival and competing post-event interpretations. Thanks Richard. While it’s a great idea I can think of two other problems: (1) firstly, how are you going to persuade your panel of experts to sign up in the first place. Sure lots of intelligent people are interested in UFOs and anomalies but not many in positions of power would be prepared to put their head above the trenches and be associated with a panel on UFOs. For most academics it would be tantamount to career suicide. Who wants to be targeted by conspiracy nuts who would immediately attack their character and frontier semantics with the slur of ‘he’s obviously working for the government/MI5/illuminati to debunk the subject’ etc etc and (2) more crucially, who is going to fund this worthy venture? In this age of austerity when money can’t be found to keep hosptials and old peoples’ homes open, how could anyone justify spending cash on something that has no real relevance to most peoples’ day to day existence? Sorry to be negative but the study of anomalies is likely to remain the province of enthusiastic individuals who have time and independent incomes to indulge in this type of pastime. Fascinating ufology case !! Yes I believe in alien drone / spacecraft. responsibilities if he didn’t believe them. In any case it cast a bad light on the USAF in a host country. How do you evaluate this passage? What do you make of Warren’s outlandish ‘observations’? In a sense his personal testimony of what he claimed to have witnessed underground in this supposed complex beneath Bentwaters is more extraordinary than the alleged landing(s) of (an) unidentified craft that we are told took place a few nights before in the woods and field to the east of the base. How does one assess his narrative? Do you personally believe a series of tunnels runs underneath Bentwaters with ‘connections to the North Sea’? What attempt has been made to verify Warren’s claims? As far as I know, Bentwaters is now deserted and de-populated. Was he lying? Is his account to be interpreted as merely an hallucinatory dream? Has anyone else corroborated his story? If he wasn’t lying, then what are the implications of his ‘discovery’ of these secret, concealed sites beneath a former East Anglian airbase? With all good wishes. I saw you on Nick’s TV programme on UFOs. Hi Richard, quite how you can described ‘Left at East Gate’ as a compelling read is beyond me. It is badly written, poorly organised and full of nonsense of the type you would expect from Peter Robbins. As for Warren, even Georgina Bruni did not believe his story (see You Can’t Tell the People) so that doesn’t get us very far! So please excuse me if I don’t waste any valuable time ‘evaluating passages’ from Left at East Gate. Life is too short. But the idea that tunnels run from Bentwaters beneath the North Sea is just one good example of the sort of story that books like this credulously disseminate. I suggest you take a look at Ian Ridpath’s website on the Rendlesham UFO to temper the wilder stories of Warren and Robbins with some verifiable facts. Verifiable facts, are that Fireballs can and do make sound effects that in some cases can be heard unlike the facts that are suggested on Ian Ridpath’s site. Dr. Clarke, I’ve noticed myself, while researching this and other supposed incidents, that the real facts usually put to rest the fantastic abominations that result out of these stories because of book deals, tours, money to be made at the expense of believers and so forth. The one thing in this article and reply’s that seem to be skipped over are the results from the hypnosis of Mr. Penniston and Mr. Burroughs that are so “sensational” that it just seems to ad less and less credence to what they’ve already said. I have however, run across similar claims from “witnesses” or “contactees” stating the whole time traveling, gene harvesting, scenario as a possible explanation for ufo’s. I was curious as to your thoughts on the subject. I think by now it’s pretty obvious to everyone that a craft of unknown origin did land in Rendlesham Forest, of that there can be little doubt. After all, I do know for a fact that these things really exist as I have seen one with my own eyes. I myself have seen what i believe to be a ufo i reported this to the police way back in the 80’s but like most organizations, you get laughed at. Has anybody travelled to the coordinates that were identified in the binary code? It appears to me that Ted Conrad for one reason or another is covering his tracks with his testimony as a lot of it does not add up. Was not this a nuclear weapons base! ” I left the sketch in my desk drawer” what the heck is that all about. No explanation is given. What about Halts tape recording? Again not much comment from Ted. Teds only explanation is he has no idea of what happened. All natural phenomena needs to be discarded (lighthouse beam etc) as all of that would have been seen before and made note of. As with so many witnesses to UFOs there is a great hesitancy to come forward with what they actually saw, Mr. Penniston included, which could account for the various delays in testimony. The other thing to note in close encounter UFO sightings is that witnesses often offer rather different explanations of what they saw. Most often UFOs leave very little physical trace and in many cases have no radar tracking. However the fact that the military/government official entities seemed to have very little interest in an unexplainable event at a nuclear base is about as crazy as it gets. It does make one somewhat skeptical. All I can say is ‘why indeed’? That’s the biggest mystery of all! The reason that Col. Conrad cannot comment on this and that is because he wasn’t there. Col. Halt WAS there and — on live tape — he says the thing was hovering, making rapid lateral moves etc. ; and later on, other objects maneuvering in the sky were “shooting beams [of light] down to the ground.” This isn’t some after-the-fact confabulation, it’s an eyewitness report in real time. Explain to John Burroughs how he got irradiated by the object to the point where the US government has now officially acknowledged it was due to the object he encountered, and has now officially compensated him for the resultant damage to his heart. Yes, this is now fully documented – just look it up or ask Burroughs himself! While you are at it, you might also explain why Burroughs’s military medical records were classified shortly after the event and remain classified. Does cold air cause that, too? Or maybe it had something to do with the multiple-witness reports that Burroughs was enveloped in and disappeared into extremely bright lights surrounding these objects. Do your homework – you conveniently miss the abundant evidence that Conrad himself is involved in the cover-up. Sorry Carla but this is nonsense. There is no document that says the US Government or any other Government has ‘officially acknowledged’ he or any one else was irradiated by a UFO in Rendlesham forest or anywhere else. If there was, I’d be expecting to read about this on the front page of the Washington Post, not on some Facebook page. There is no evidence that the VA took this into account in making their settlement. Indeed, there is no reason that they should have taken it into account, since it is only speculation based on poor understanding of the case. Sorry Dr. Clark, but Carla has a major point in that Conrad was not an actual witness and Col. Halt was. You have taken the Conrad stuff as somehow the truth and the Halt stuff much more open to interpretation even with recording and all. That fits conveniently into a Skeptics view like yourself. No wonder some think that you are a disinformation agent for MoD or some other agency. I myself do not think you are up to the task. In any case, the recording more or less speaks for itself and no matter how you or Ian spins it this evidence suggests something very unusual happened not satisfactorily explained by either of you. I agree with you that the ‘evidence suggests something very unusual happened’, I just don’t agree that unusual = ET visitors or time travellers. There are other unusual possibilities that do not need to invoke hypotheses that are unfalsifiable. And you miss the point about Col Conrad. No he was not a ‘witness’ but that is the whole point. He was the base commander, Halt’s superior. Halt was speaking to him by radio in real time whilst the ‘unusual lights’ were prancing around in the night sky. Conrad went outside, taking a group of other senior officers with him, and scanned the sky following Halt’s directions. As Conrad says, despite a sparkling clear sky and 360 degree visibility, none of them could see anything unusual. Not only that, a call patched through to RAF Watton via Bentwaters tower seeking radar confirmation, came back negative – and was double checked by the CO at Watton (whom I have interviewed). ‘The Americans kept coming back and insisting there was something there but there was nothing visible on the radar picture’. Now in my view only a very blinkered person could insist none of this is of any relevance because Halt was there and Conrad wasn’t. As for the ‘recording speaks for itself’ again I agree with you. The recording by Halt sounds like a group of guys blundering around in a dark forest chasing ‘UFOs’, winding each other up and, with each minute, losing their bearings and getting more and more excited and less and less able to make objective observations. So you’re absolutely right, the recording does speak for itself – but as evidence of anything other than credulity, its useless. Mervyn, there is no evidence that anything crashed in Rendlesham Forest. Once you realize this, everything else falls into place. Your right there is no serious evidence that anything crashed. Because some of the witnesses, which you continue to disregard their , say what ever it was ‘landed’. I am kind of wondering whether you bother to read any of the witness statements. Almost all of your supposed scenarios disregard the actual witness statements and are supplanted by your own imagination of what could have happened . You need to get another hobby. In regards to Ian Ridpaths explanations of this case I find that there is always some truth in what he says. For instance he says that the lighthouse is in a direct line from the east gate to where the witnesses first observe the lights. However he does not go on to say that the you could not see the lighthouse effects from that same gate entrance because of the tall trees blocking the view. You could only see the lighthouse from the northern end of the open field after the woods. This has been documented by others but Ridpath seems to stick to his theories that the lighthouse covers most of the observations. In regards to the fireball and or satellite reentry again they could explain observations but they do not explain the lights as per what the actual witnesses said they saw. Fireballs and space junk cannot continue over the time frame of this event. Ian Ridpath has some simple explainable answers but unfortunately his answers do not fit the witnesses accounts. In order to believe Mr. Ridpath you have to disbelieve much of what the witnesses. said they saw. The fact that the lighthouse is not visible from East Gate is a key point in my explanation, since it helps explain why the witnesses did not recognize it when they saw it. Despite what many people like to claim, the witnesses were not familiar with the lighthouse at all. Col Halt was the exception, but he has admitted that he thought it lay in a different direction, which explains why he was fooled, too. As I have attempted to explain for the past 30-odd years, the initial incident was sparked by the 3 am fireball, but that the various lights observed subsequently have different explanations, namely the lighthouse and, in the case of Halt’s night, bright stars. These explanations are firmly based on the eyewitness reports, both the written reports from Night One and Halt’s own tape recording on the subsequent night. I hope this is clear now. I stand corrected by Ian Ridpath on the issue of seeing the lighthouse beacon from the east gate. He has posted a link to a page and a sidebar note about not being able to see lighthouse beacon from the east gate. I guess I missed this when reading initially the page. I offer my apology’s for my mis statement. It would be great if someone would put together a decent timeline/map that is based on the main witnesses observations of this event. I believe that Halt did see the lighthouse at some point in his investigations but exactly where he was I am not sure. However this does not explain the majority of his observations. Do you have any evidence that Ted Conrad is telling the truth? If so please replay. Harry: do you have any evidence that Halt, Penniston, et al are telling the truth? Both have changed and adapted their stories numerous times in the years that have elapsed since 1980-81. Details have been added, others dropped. Penniston’s story has so many holes that it would be escoriated under even the most basic critical questioning if he ever made the error of repeating it before a congressional committee or inquiry. One story contradicts the other – even the most basic details of time, date, location are unclear and have been influenced by the UFO industry output these men have all absorbed now they are part of the UFO lecture circuit. So what, precisely, is ‘the truth’? The best way to get an idea of what happened is surely to listen to *all* the voices, not just the testimony that we personally like. We have all heard what Halt, Penniston and Burroughs have had to say. Conrad was their superior officer and surely any objective, open minded account of the case has to give him the opportunity to speak. If Conrad was saying ‘yes it’s all true and I met the aliens and it’s all been covered up’ I wager his story would be not be doubted or questioned by those who want to believe. Inconvenient testimony always upsets UFO believers. Sorry, it is is not a matter of ‘want to believe’. In this case, It is a matter of what and who to believe. In many cases I see skeptics who are the believers not the other way around. Conrad was not an actual witnesses to the sightings, he even says so. Many others were witnesses incl Halt, Penniston and Burroughs. Yes, its true the stories of some have changed and been expanded upon to some extent over the years. But in my view that does not discount their basic observations. To rely on Conrad over the others is foolish. However I do agree with you that ‘all’ voices should be heard. It’s too bad that many skeptics and UFO ‘believers’ alike do not really understand this concept. Trying to find persons of an open mind and not taking a dogmatic approach is a difficult task. You should go back and actually listen to Halts tape. Is he really just seeing/reacting to only naturally caused events? If so he probably should not have been the deputy base commander of a nuclear installation. What happened to those blotters after the first night? Maybe Conrad could tell us but I do not think he will. Sorry Harry the article you are commenting upon is not relying upon Conrad over the others. It is a piece of journalism that puts on record the views and observations of people who were involved in the Rendlesham story, but who have been ignored by those who wish to uncritically promote the idea that something inexplicable and otherworldy occurred. The problem is that if all you hear or want to hear are the (contradictory) voices of Halt, Penniston & co then you do not get the full picture, regardless of their status as ‘witnesses’. I agree that none of this discounts the basic observations. But what version of the ‘basic observations’ do we accept as being genuine? The original statements taken down by Halt? The ones that Halt says are genuine but which Penniston and the others say have been altered or messed with? Do we take Halts statement in, say, 1981 as being reliable or 1987 (when suddenly the beam on the WSA appears) or do we choose 1997 (when it had again altered substantially), or 2010 when he was claiming there was a vast conspiracy involving the US and UK governments. Then we have Penniston and his fabulous notebook that was never mentioned to Conrad at the time but which now, like the Holy Grail, keeps producing new material. Fist it was sketches now its binary code as he completes the transformation into full blown contactee. As for Halt’s tape you can read whatever you want into the content, but the fact that the people on the tape are military people makes no difference whatsoever. There are literally hundreds of examples from the UFO literature where military witnesses have misperceived natural and man-made phenomena as something extraordinary. According to Hynek even pilots make poor witnesses. As you have already admitted Halt probably made a mistaken observation of the lighthouse during his expedition. If you read the last paragraph of his MoD memo that describes bright objects in the sky that were visible for several hours (until the disappeared in the dawn) no sensible person can honestly claim these were not bright stars or planets. Why did Halt report them as UFOs? Simply because he was caught up in the excitement of the UFO syndrome after a spending a night chasing lights in a dark forest. Go watch The Blair Witch film Harry and you might get a better idea of how easy it is for people to become disorientated in a forest. Conrad’s evidence is interesting because he makes it clear that, early on the same night as Halt’s expedition, he sent out trained and trusted SP’s into the forest to conduct a formal investigation as the airman’s claim that the UFOs had returned. They saw nothing and came back with nothing. Halt then took it upon himself to go out with his own team, unofficially, and that’s when the fun began. I would not be at all surprised if someone in that team was pulling his leg, knowing how easy it was to mistake the beam of the lighthouse for something strange. The full story will not be known until some of those who were with Halt (such as Bruce Englund) decide the blow the gaff on what really happened. But I suspect the story has now grown so large, like a snowball rolling down a mountain, that the ‘truth’ will never be known as there is too much money at stake and too much face to be lost on behalf of the key participants. I’m sure none of this will make one iota of difference to what you think about this story, but I have found the simplest explanation is usually the correct one. If the best evidence we have for aliens landing in Rendlesham forest is Halt’s tape then I’m afraid you really are barking up the wrong tree! It is most important we understand the nature of what we see, not what we want to see. Do you have evidence conrad is telling the truth, works both ways , so i guess its down to who you believe. It is up to those who make extraordinary claims to provide proof. As Conrad is not making any extraordinary claims, only ordinary ones, no proof is needed. I reported his version of events. If you choose not to believe it, that’s your prerogative. Sure the stories have been embellished over the years but unless a hoax can be proven then the only other explanation was that ALL of the witnesses have lied and I am only referring to the first statements made. All of these enlisted men + Halt had nothing to gain but plenty to lose. On the other hand Conrad has plenty of motivation to be deceitful particularly if a cover-up is desired. Halt and his men, standing in a farmer’s field’ and documenting the incident in real-time is solid. Ridpath’s lame explanations are just plain ludicrous and I’ve read them several times. I’m not saying that the events in the farmer’s field are ET but they sure aren’t lighthouse silliness or stars. Either the men saw ET activity, hallucinating or an extremely complicated hoax was conjured. I see nothing else. Jim, sorry but you’re wrong. If we’re talking about the ‘first statements’ made by the airmen, i.e. those made in their own handwriting and collected by Halt shortly after New Year in 1981, then the statements actually support the idea they saw and followed the lighthouse. Burroughs actually says they followed a light for 3 miles before they realised it was a ‘beacon’ (i.e. the lighthouse). So to then dismiss the lighthouse explanation as ‘plain ludicrous’ is in itself ludicrous. The fact remains that over and over again in the UFO literature we find examples where ‘credible witneeses’ – police, pilots, aircrew, radar operators – have misperceived ordinary things as extra-ordinary things. There are literally thousands of examples. Therefore it not ‘ludicrous’ to suggest that Halt and his men saw and misperceived amongst other things, a bright bolide meteor, bright stars & planets and the lighthouse. Once the rumours begin to spread that there ‘is something weird in the sky’ people, even so-called trained observers, have gone on to see those things in a UFO context. Again there are thousands of examples of this in the UFO literature. There are Zero examples of something that has been seen and later identified as an extra-terrestrial spacecraft. I don’t see it as a choice between ET activity or hoaxing. Nothing is ever that simple. And the definition of ‘hallucination’ is simply seeing something that isn’t there. What we have is a mixture of misperception (of a number of different unrelated things over 3 days, remember! ), the work of rumour and gossip, the will to believe, the embellishment of the story over a 30 year period by the participants and UFOlogists – plus the very real possibility that some of those involved are actively making it up as they go along. The lesson learned from some 35+ years on the saucer beat is that it is never a simple answer! 1) The lights (blue,red, white) are seen *prior* to anyone being in position for the lighthouse to be a factor. As I understand it, due to the density of the forest during this period (from the back gates of the forest) the lighthouse could not have been the reason for these lights. How is this the lighthouse? 2) The statement makes no mention of these early lights as blinking, as would be the case if the lighthouse were a factor. 3) Why the multiple colors being mentioned? One thing the human perception is accurate at is discerning colors. Next to impossible to mess that up. 4) His statement mentions that the ‘beacon’ is realized at some point after the original lights have been ‘lost’. Yes, at this point he has been walking towards the lighthouse. not light. He is describing the multiple colored lights. In which he then says that they disappeared. Now and only now does he claim they see a beacon and decide to walk towards it. 6) Shortly after the beacon being recognized, he is told to return (by radio, I presume) and states that a BLUE light was seen ‘to our left, in the trees’. This is definitely not in the direction of the lighthouse. 7) The sketch of his interpretation of the lights sure do not resemble any lighthouse. You just cannot make the claim that the lighthouse is the ‘be-all, end-all’ reason for his (or their) sightings. I certainly can see where a small spattering of statements may be a result of the lighthouse but the preponderance of the statements do not support this theory. I still say that ludicrous best describes the lighthouse theory. Jim, I am not saying and never have said the lighthouse is the ‘be all, end all’ reason for the sightings. 1. Security guards saw bright lights apparently descending into Rendlesham Forest around 3 a.m on 1980 December 26. A bright fireball burned up over southern England at the same time. 2. The guards went out into the forest and saw a flashing light between the trees, which they followed until they realized it was coming from a lighthouse (Orford Ness). 3. After daybreak, indentations in the ground and marks on the trees were found in a clearing. Local police and a forester identified these as rabbit scrapings and cuts made by foresters. 4. Two nights later the deputy base commander, Lt Col Charles Halt, investigated the area. He took radiation readings, which were background levels. He also saw a flashing light in the direction of Orford Ness but was unable to identify it. 5. Col Halt reported seeing starlike objects that twinkled and hovered for hours, like stars. The brightest of these, which at times appeared to send down beams of light, was in the direction of Sirius, the brightest star in the sky. So its obvious from that summary that the sceptical position is not and never has been that the lighthouse explains all the phenomena. In my long experience UFO events are a concatenation of disparate events and phenomena, that come together to produce an ‘experience’ that is interpreted by the observer, the media and the UFO industry as something extraterrestrial and other-worldly. Again long experience has shown that simple explanations are the best ones. The simple explanation in this case (Ian’s theory) adequately explains the events without recourse to elaborate explanations invoking time travellers, ancient astronauts or what-not. The bottom line is that extraordinary claims require extraordinary evidence. Even the fireball theory (I’m assuming you are referring to a meteor) is weak. These last seconds at the most and unless you live in a primitive civilization would immediately suspect that as what was being experienced at that moment. I’m totally agreeing with you that ‘extraordinary evidence’ is required and we don’t have it. We only have testimony from quite a few individuals over multiple evenings and much of it has been embellished, no doubt. However, the first witnesses experienced something extraordinary that cannot be explained by meteors, lighthouses and stars. Col Halt, just to mention, was a seasoned officer who, likely had experienced a number of stressful military situations in his career. I would have to believe that In order to attain his military rank, he must be able to demonstrate exemplary critical thinking. I would also have to believe that following his experience he must have taken some time to analyze and reflect on his sighting before putting his statements on paper. Based on his critical thinking skills he would have had to ponder whether he had misinterpreted his experience. He says no, ‘I know what I saw’. Also, the personnel that accompanied him into the forest that night have corroborated his story to my knowledge. I’ve certainly not heard anyone refute Halts statements. I believe that gives Halt’s experience even more credibility. It is highly probable that what he saw, his night out, should be classified as extraordinary evidence. That is how I see it anyway. Evidently, you and many others do not. Jim, I can’t argue with your statement that Charles Halt’s story should be classified as an ‘extraordinary experience’. But it would be ‘extraordinary’ whatever the ultimate cause. If Halt saw and misperceived the Orfordness lighthouse as a UFO, that in my book equates with an ‘extraordinary experience’. Does ‘extraordinary’ only refer to something that ihat has a supernatural/occult/extraterrestrial origin, external to the human being who experiences the event? Nope I don’t think so…really you should do some reading on the extraordinary misperceptions that permeate the history of UFOlogy. The UFO incidents, many of them vouched for by highly credible witnesses – police, pilots, military – who have, in most cases, been genuinely and honestly fooled by both natural phenomenon and man-made aircraft, balloons and other mundane objects. ‘It followed our car and hovered over our house. Didn’t follow any other car only ours’ – the planet Venus, watched every night for one week. ‘No jet can move that fast…it took off like a shot from a cannon’ – advertising plane. In this context, Col Halt’s story does not stand out as being in a different category to any of the above stories, all told by ‘credible witnesses’. The idea that he could not possibly have been fooled because of his military rank etc is a common fallacy. I posted a reply in regards to this, and was not approved.. First of all how can one explain a lighthouse, a comet or a satellite move in so close that it would hover and scan the underground bunkers for nuclear warheads that were stored there at the time ? I have replied this (my responses are not being approved) ,and I am gong to reply again , since you are responding to people with the “church approach” That is you are reacting in a biased manner to the comments people share even when they are polite, simple, and considerate. First of all meteors, lights from lighthouses etc, amply do not hover over nuclear weapon installations and scan the warheads below. This has been documented and witnessed that a craft regardless of where it comes from made an appearance and scanned the nuclear installation, and one of the important, basic and most factual factors and reasons for the Rendlesham Forest incident, which somehow or strangely or conveniently gets dismissed, in order to detour ones thought away from the obvious. I’m not aware of any responses that have not been approved. You are quite correct that ‘meteors, lighthouses etc do not hover over nuclear weapons installations and scan warheads below’. Where is it documented – apart from within the self-referencing UFO literature – that ‘craft’ have done so at Rendlesham? If Halt believed the ‘unexplained lights’ (his words from his 1981 memo, not craft) were conducting such an intrusion into a NATO secure compound, then why did he not mention it either in his verbal report to his superior officers or, more importantly, in his formal written report to the UK Ministry of Defence. You claim this is ‘documented’ but there is no mention of it in Halt’s formal report. If what you say is true then Halt is either guilty of neglecting his duty or, more likely, he had no such concerns at the time of the event. In the latter case the only conclusion one can reach is that the stories about ‘craft’ scanning nuclear weapons is an elaboration that is part of the developing narrative that is typical of both the Rendlesham and Roswell legends. It fits neatly into the UFO industry’s determination to link UFO reports with nuclear installations. This ultimate source of this theme can be traced to Donald Keyhoe’s foundation myth that UFO reports had increased since 1945 as a result of our atomic experiments. An examination of newspaper reports describing aerial phenomena from 1897-1909, long before nuclear weapons existed, demonstrates the falsity of this belief. An alternative explanation is that there are more UFO reports made from the vicinity of nuclear bases simply because their personnel are, by nature of their duties, more observant and likely to report unusual aerial phenomena. When you take into account that 95%+ of such phenomena turn out to be IFOs, the so-called attraction of UFOs to nuclear sites becomes meaningless. Lighthouses, comet’s and satellites do not hover and scan bunkers, though some might imagine they do! Actually if you saw the Orfordness lighthouse in 1980, when it was at full power, pulsing through the trees, it *did* appear to be hovering at ground level when seen from the forest. The idea that the UFOs scanned bunkers is an embellishment that was never part of the original story reported by Halt – imagined is the correct word! Surely at the time if it was thought to be the lighthouse, this could have been checked on any subsequent nights to say to the witnesses is this what you saw? Is Jim Penniston lying when he says he saw and touched a UFO? Why would he make up a story like this? Please don’t say he was thinking about writing a book in the future. As far as I know he has not written a book. I have read the book by Larry Warren. In it he describes many strange experiences. If he wanted people to believe him, why would he relate that he was kidnapped and taken to an underground base? Why would he make up something that would undermine his credibility? Would the deputy base commander Col Halt risk his reputation by writing his report and investigating personally, with his undeniably genuine tape-recording of his witnessing of the light, which he described as moving around in the sky and silently exploding into multicoloured pieces (as far as I recall the story)? He has said that he was aware of the lighthouse, and It was not what he saw. Any airman is familiar with Venus in the sky. Halt has changed his story several times over the years to avoid losing face on the lighthouse issue. The tape recording proves that he was observing the flashing beam of the lighthouse, it can overlaid with the timing of the flash shown on Ian’s website. As for Penniston and his fantasies people make up and embellish existing stories for many different reasons. Financial reward is only one of them. Others get a kick out of stringing along gullible people who want to believe – by creating cults and new religions, which the UFO/Rendlesham personality cult increasingly resembles. As for the claim that ‘any airman is familiar with Venus in the sky’ this is patent nonsense. The UFO records are full of examples of police officers, pilots and other so-called trained observers who have misperceived celestial objects including stars and planets as UFOs. Moral of the story – eye-witness testimony is unreliable. Military witnesses are no more reliable than the average person in the street when it comes to observing ‘UFOs’. No one is a trained observer when it comes to identifying such elusive aerial phantoms. I have been revisiting the Rendlesham Forest incident and recently accessed the lecture given by Gary Heseltine of the British Transport Police on 6 August, 2011 given at the University of Leeds as part of the 3rd Annual British Exo-politics Conference: http://www.exopoliticsgb.com. I understand Heseltine is a serving police officer and has created a police database which collates UFO sighting reports by serving and retired police officers. I have no doubt that you are aware of this man and the compelling manner by which he presents his evidence attesting to what he clearly holds to be the unquestionable authenticity of the 1980 Rendlesham Forest phenomena. Cool-headed, highly rationalistic, almost the stereotypical policeman, he offers his account at Leeds in a way which, to me at least, leaves one in little doubt that the reflective and critical perspectives on the case offered by such people as Ridpath, Thurkettle, Conrad have to be rejected as ultimately untenable – at least this was the distinct impression I was left with. He is prepared to acknowledge the extraterrestrial nature of the experiences and highlights what he holds to be specific and relevant evidence to validate his argument: physical evidence, corroborative evidence and documentary evidence; details of what these clusters of evidence actually are can be gleaned from his lecture. He presents these sets of evidence in the way that one would expect from a trained member of the police force when involved in the systematic investigation of a criminal case. There is nothing sensationalistic in his discourse. His sensibilities and approach are miles away from Larry Warren’s meretricious account (‘Left by East Gate’), for instead of being swept along by Warren’s colourful flights of fancy, we are invited as listeners to come to terms with conclusions arrived at via a measured and seemingly thorough weighing-up of all the aspects of the Case. To state that the 1980 Rendelsham Forest case has become a source of division amongst investigators is to state the obvious. Heseltine’s position may be viewed as occupying the polar opposite stance from Conrad. Heseltine believes the lighthouse theory was ridiculous right from the start and should never have been invoked. The clue to the mystery lies, he believes, in the illegality of the presence of nuclear ordnance in the Weapons Storage Area, a possible explanation that he stresses should be understood and retrospectively interpreted against the background of the tensions of the Cold War then under-way: the massing of Soviet troops on the Polish border to counteract incipient moves towards the establishment of democracy in that country. What I want to ask you is this: Are you impressed with Heseltine’s arguments? Has he got it right? If not, where are the flaws? Hi Richard, I’m at a loss to understand how listening to Gary Heseltine can lead you to reject what you call the ‘reflective and critical perspectives’ on Rendlesham, or indeed any other UFO story. He is no longer a serving police officer but even if he was that makes no difference. He believes that some UFOs are alien craft and there is a huge conspiracy to hide the facts from the public. Of course he is cool and compelling, but so are many other people who sincerely believe in lots of weird things. The idea that we should place faith in someone’s statements simply because of their social status is a little naive. For example, Lord Dowding was the head of the RAF and is widely credited as being the mastermind behind the British victory in the Battle of Britain. But does that mean I have believe, as he did, in fairies, spiritualism and flying saucers? I have met Gary Heseltine and conducted a lengthy interview with him that appears in one of the chapters of my new book, How UFOs Conquered the World. Like you I found him a very compelling speaker who clearly believes in what he believes, but his arguments are based upon the standard UFO myths that are part of today’s popular culture. There are so many flaws in his arguments that it would take a month of Sundays to even start working through them. But, seeing as you asked, one big flaw is the fact that no one has found conclusive evidence that nuclear ordnance was stored at Bentwaters-Woodbridge in 1980. This is stated as fact by Heseltine et al but it is not proven. Therefore Gary is making wild assumptions to explain something that isn’t even certain. There were nuclear weapons stored at plenty of other places (Aldermaston, Lakenheath etc to name just a few), so why did the aliens not visit those too? And even if there were warheads at Bentwaters/Woodbridge, how does it follow that aliens would travel across the universe to shine beams on it just for entertainment of a group of airmen in a forest, on one particular night, yet remain invisible to their superior officer, air defence radar and the entire population of Suffolk? Common sense alone should suggest the whole edifice is absurd. The idea that UFO aliens are interested in our nuclear facilities, and have been coming here in greater numbers since the atom bombs in 1945, is a complete nonsense. It was part of the myth created by Donald Keyhoe in his books during the 1950s, when people began looking for salvation from friendly aliens as an antidote to the threats posed by Cold War nuclear annihilation. There’s nothing wrong in believing this stuff, it’s a beautiful modern myth but please don’t suggest that it is based upon hard facts of the type offered by Ridpath, Thurkettle, Conrad etc. Gary Heseltine and other UFO afficionadoes are just repeating and re-defining that foundation myth for a new generation. Their stories are presented as cool and factual but, in my view, there is an underlying religious element behind their raison d’etre. So in summary, no I am not impressed by Heseltine’s arguments but I respect the fact that he believes what he believes. Sorry but this is not a credible position – it might convince people who have only a passing acquaintance with the rules of evidence. But extraordinary claims require extraordinary evidence. Gary can only provide the claims. While I agree with you that the Rendlesham Forest Incident is largely unsubstantiated folkore, and while I believe that Penniston´s binary code is a fabrication, I do think that you are being too judgmental about Penniston´s and Halt´s behaviour. You say that “the recording by Halt sounds like a group of guys blundering around in a dark forest chasing ‘UFOs’, winding each other up and, with each minute, losing their bearings and getting more and more excited and less and less able to make objective observations.” Quite. But if we postulate that they actually saw something that didn´t relate to anything they had ever seen before; and that they didn´t simply make the whole thing (which I think is unlikely), then they would have had to be super-human not to work themselves into a frenzy about it. It seems to me that you jump to the conclusion too easily that someone who is emotional about something that he or she has experienced will automatically make an unreliable witness, I am not sure that that is the case, and I´m not sure if a simple voice recording is sufficient to tell whether they actually were all that emotional and, as a result, unable to trust their cogntive faculties as it were. At the same time, you seem to imply that Conrad´s account is somehow more reliable, and you seem to base that assumption on the simple fact that he checked and saw nothing (plus the radar operators who, apparently, didn´t see anything either). Yet, not seeing or hearing anything doesn´t normally make you a brilliant witness. Nor are you necessarily all that objective when your answer to out-of-the-ordinary experience is always to look for simple explanations for everything. It is a good first course of action as long as you don´t forget that there is a fine line between being objective and being opinionated. I remember, a couple of years ago, falling asleep with my glasses on, and upon waking up, searching the room frantically for my glasses while they were sitting on my nose the whole time. That is what can happen to you when you have a clear idea about reality, about what is plausible and what isn´t. Now, I am not desperately trying to prove what was on the radar and what wasn´t, that´s not the point, and we won´t know anyway. I am merely saying that our idea of reality has a direct effect on how we perceive it, and that applies first and foremost to how we remember things. Therefore, I think you are being to harsh with Hart and Penniston when you insinuate that the twists and turns in their stories over the years is somehow proof of a flaw of character on their part. Even if it seems pretty clear that Penniston, for one, has seen the commercial potential of his story, it is a fact that most of us, including myself, are hard pressed to give an accurate account of what we did the day before yesterday; let alone of what we did in 1980, and if what we did the day before yesterday was particulary significant to us we tend to embellish it all the more (which is why it is such a shame that, apparently, no proper investigation was instigated when the memories of all involved were still fresh) So, when you say that “inconvenient testimony always upsets UFO believers”, that is very true, but then inconvenient testimony about anything has an infuriating tendency to upset us all, including yourself. Hi Marius, I’m hard-pressed to find anything in your screed that I disagree with. However, you trip yourself up slightly in the first line where you say that ‘I believe Penniston’s binary code is a fabrication’. If the code is a fabrication then Penniston is a liar. Let’s suppose that Penniston is making his case in a court of law with a jury of 12. Imagine you are his barrister and you make a very convincing case about why they should not dismiss his story, using all the special pleading given above. Then M’learned friend for the prosecution introduces evidence that he fabricated his binary code/time traveller story, having noticed its ‘commercial potential’. So while I agree that it can sometimes be unjustified to jump to the conclusion that someone is an unreliable witness because they are emotional about something that he or she has experienced, all the accumulated evidence in this case leads me to conclude that does not apply. The key players in the Rendlesham saga are, quite simply, making it up as they go along. As a result we will never, ever, get to the bottom of what may or may not have happened in the first instance. The Rendlesham “incident” was a non-event perpetrated by a group of bored fantasy prone USAF personel who, in the words of a serviceman actually involved in the whole sham, were ‘just a bunch of guys goofing-off in the woods one night’. The “case” was closed and discarded by the UK government as having no interest & no significance whatsoever within months of the alleged encounter. Rendlesham only has value to UFOOLs & true believers who preserve it as a sacred cow. The continuing ridiculous “revelations” by the persons involved exposes them as attention seeking liars. Hmmmm… in the ‘words of a serviceman’ … well there you go. That’s all the proof I need! Absolutely no merit in the stories of dozens of other servicemen that say different. Thanks for clearing this up for us UFools! Any chance of getting a web link of this so called ‘serviceman’ statements? The quote provided by Blackbill is from Col Sam Morgan who succeeded Ted Conrad as Base Commander. But I don’t think any of this will change your mind – or alter your opinion of this ‘incident’. People believe what they want to believe or prefer to believe. That includes me to! Again, the problem is that multiple serviceman witnessed several extraordinary events that cannot be explained. Some have exaggerated and some are honest and credible. I just wished more people would focus on what did happen as opposed to ‘nah, it’s just a bunch of baloney’. You simply cannot discount the testimony of ALL the witnesses. A very puzzling, complicated case that will not and cannot be explained by simple means. Some people THINK they have it figured out (Ridpath) but their explanations do not encompass the total package of testimony. Very hard to separate fact from fiction… I guess you will forever have the “yeas and nays”. Frustrating. Dear Dr. Clarke: My official position, formed after months if not years of reflection and study of the ‘Rendlesham Forest Incident’ of 1980 is that it did not happen. There never was an ‘unidentified’ craft, and quite probably there was no craft at all. The incident was carefully fabricated by juvenile American airmen at a loss to know how to cope with the bleakness of a British winter endured thousands of miles away from the homeland in the depths of an unfamiliar Suffolk. Most probable is it that they were bored, so they psyched themselves, auto-psychologically and maybe artificially using illegal substances and weaved a fantastical tale which grew out of control and which developed a life of its own. This is now what I firmly believe. The saga is entertaining, even compelling and it retains much of its power even today, 35 years later, to fascinate and obsess the easily deluded. It is sad to see how many otherwise astute minds fell for it to the extent of being responsible for swelling the airmen’s original impulse into a marketable brand of huge proportions. The whole thing was a gigantic scam. Scarcely any convincing evidence existed immediately after the ‘sightings’ confirming that what was alleged to have occurred did, in fact, happen; indeed, quite the reverse: whatever ‘evidence’ was subsequently adduced to buttress up the claims has turned out to be no more than than flimsy and unconvincing trivia. If the ‘event’ or ‘events’ had happened, as preposterous and other-worldly as the ‘witnesses’ ‘report’, then the after-effects should have been equally breathtaking. The fact that they were not is surely sufficient proof that the ‘encounter’ was nothing more than a stupendous hoax. There is a field of study here which needs to be opened up: the sociology of UFO encounters and the posing of the central issue, namely, what is it about the psychic constitution of the human being – particularly collectively – that yearns to have ‘contact’ with the non-humans from the far reaches of the galaxy? How can major academic disciplines offer an insight into why people – some people – seem to need to entertain such beliefs? And how is it that an irresponsible and rather childish impulse to create a web of fantasy can develop an autonomous life and even increase alarmingly in compelling power and proportions in the way the ‘Rendlesham Forest incident’ did? What is the relationship, if there is one, between educational level and the display of credibility towards unknown flying craft? If the above seems to read as an intolerant rant, an utter write-off of the claims we have become familiar with, then my reply is that after a long time spent thinking about the story and reading the relevant material, I am left with no alternative but to reject the ‘incident’ as nothing more than a mischievous practical joke..
A group of bored servicemen psyching themselves up and grossly inflating a non-incident, which is then picked up by shifty UFO peddlers & their gullible UFO evangelist followers, and cobbled together into a legend. The whole thing is A to Z nonsense. This is a complex case and what intrigues me the most about it are the number of highly credible witness testimony-high ranking officials. Not just US military but UK military intelligence officials, Lord Hill-Norton’s “UK former Chief of Staff” statement stands out to me. Why would a man, with his credentials, highly respected, be willing to comment on a case like this at all unless he thought the story & witness testimony had merits. I find his willingness to jeopardize his respect by commenting on its possibility adds a great deal to the credibility an probability it happened. I guess my question simply put is why did he do it? Exactly. Both ufologists and debunkers constantly put too much emphasis on a ‘character’ of a witness. A character of a person is not a scientifically measurable quantity. Its just a tool both sides use to politicize the topic and to stab each other in a back. As Richard Staines said in a post above: “A garbage man is just as qualified as a PhD to report a UFO sighting”. Somebody having Phd in humanities would utterly incompetent when reporting on most scientific subjects. The Orford Ness lighthouse opened in 1792. Bentwaters/Woodbridge had been open more than 3 decades by 1980. Thousands of men and women, thousands of days. Just three nights out of all those weeks, months and years it gets mistaken by dozens of military personnel for a UFO? As an explantion it’s almost as silly as the idea it was aliens. Nick Pope of course, thinks the lighthouse theory is absurd. The lighthouse keeper is also on the record as saying the lighthouse has always had a large blocking plate to stop the beam shining inland onto Rendlesham, which further rules it out as having any relevance to this issue. Has the theory of a broken arrow cover-up been totally debunked? It has always struck me that the some of the lights and the “just above” background radiation levels might well have been the result of the accidental release (not firing) of a missile. The subsequent time the USAF personnel spent in the forest would be for safe retrieval and the apparent development of the UFO story would be ideal for covering this up. IHO second hand opinion like that one of Col Conard is next to irrelevant. He wasn’t there, so any interpretation of his is automatically just a fabrication made to protect his pension scheme. The only source of reliable information are the actual first hand witnesses and only their interpretation of what they’ve seen counts. Lt Col Halt in many interviews had shown a grudge towards the way he was treated by his superiors and held outside of the loop during the investigation. He appears to be motivated by desire to revenge to his superiors. Now, that grudge itself can’t tell us if he has seen UFOs or not. It is doubtful to suggest that alleged witness are spinning stories just for money, because UFOs are nowadays a niche topic for a dying audiences. Just in the last two or three years at least three major ufologist died of old age. Most publishers refuse to take on UFO related books just because there is no money in them any more. Majority of ufologists need to pay out of their own pocked for expenses when they attend conferences or give lectures. Topically it is more of an expensive hobby, than a shrewd business move. I have never documented what I saw from Essex on Christmas night 1980 but I am convinced it was part of what happened at Rendlesham Forrest. I would have been 16years old and was with 2 or 3 friends who saw it too. I went home and told my dad who phoned the met office the next day and was told there was nothing unusual in the sky that night. I know what I saw though! Thank you for your article. I have one observation. Is it not true that the facts of an event when it happens are the most accurate and as time goes on and the story is retold and retold the facts slowly get morphed into less accurate details? I believe the original report/facts are the most accurate. As for Mr. Conrad, he was not there and I would not balance his beliefs over that of Mr. Halt. Thank you! All we can conclude from the Rendlesham case is that you cannot trust anything you are told by the USAF, and that certainly includes Conrad. I would sooner believe that the whole story was a hoax/fabrication than the ridiculous notion that these guys mistook a lighthouse for a spaceship! If that were true then there is no way that Halt’s memorandum to the MoD weeks later would ever have been written as the witnesses and/or investigators would have realised their error long before then. So, if anyone really knew what happened it would be the man who witnessed nothing at all because he wasn’t even there? And his so-called credibility is based on “his own statement that…”? In other words, Dr Clarke believes Conrad to be credible simply because Conrad claims to be credible? This alone betrays the lack of objectivity of the author. I personally believe that we will never know what really happened and I’m okay with that. I don’t need to try to rationalise these events with absurd assumptions about stars, fireballs and lighthouses. I’m comfortable enough with my own intelligence to be able to admit that I simply don’t know what happened that week in Rendlesham Forest. I am certainly not arrogant enough to tell other people what they witnessed when I wasn’t even there. ARD your email betrays a complete lack of knowledge of the primary events themselves. What it betrays is a superficial knowledge of the story as it has been portrayed in a variety of TV programmes, news stories and internet discussions. The statement ‘the ridiculous notion that these guys mistook a lighthouse for a spaceship’ pretty much sums up your ignorance about the causes of UFO reports in the first place. Even the most rabid UFO nuts accept that 90% of sightings are caused by people mistaking normal things for extraordinary things. In which case why is it so outrageous to accept the possibility that some of the Rendlesham sightings were of ordinary things, such as the lighthouse. If you can absorb this and still feel it is a ridiculous notion then nothing is ever going to change your viewpoint on this subject. The idea that we have choose between ‘spaceship’ and lighthouse is itself nonsese. For starters Halt never claimed, in his original statement, that he had seen a spaceship. His memo to MoD is titled ‘Unexplained Lights’. The UFO industry has turned those unexplained lights into spaceships, taking Halt and his merry band with them for the ride. a) he was indeed there and was speaking to Halt by radio at the very moment he was watching his ‘spaceships’. Yet he and other senior officers saw nothing. If you don’t think that is a relevant fact then you don’t understand the basic rules of evidence. b) like it or not as Base Commander he carried out an investigation and concluded what he concluded. His testimony is therefore relevant to the incident, whether you like it or not. The fact that he disagrees with the narrative that you personally favour isn’t my problem. By claiming that I have a lack of objectivity simply by reporting what he says say more about you and your prejudices than it does about me. On one thing we agree – I simply don’t know what happened that week in Rendlesham forest. But I don’t understand how it takes our understanding any further by refusing to listen to voices that offer alternative explanations to the nonsense that is regularly pumped out online via the UFO industry. It is everybody’s right to dispute the statement by Col Holt, and also the live recording made during his encounter. He was accompanied by several airmen, who presumably could back up his statement. He said the light was winking and seem to be dripping a molten substance. He said it looked like a large eye. Why would he give this description of what you believe was a lighthouse flashing in the distance, and which Holt has stated his awareness of the lighthouse, and he was not confusing the two? One puzzling feature of the whole affair is, you have to ask why he as Deputy Base Commander, would risk his career by making a report, for which he could be ridiculed. If he had not personally gone into the woods to investigate the lights which he was advised had come back on the second night, then he could have said that the initial sighting by Jim Penniston was not credible. However he took the trouble to investigate, and was sufficiently convinced by what he saw, to put in his report, and stand by it, all these years. I believe Col Conrad had no direct witnessing of any event, and therefore would be more likely to dismiss such things, as you indeed do. We all know how easy it is to misinterpret lights in the sky at night, but I really don’t know how you can ignore all the thousands of daylight sightings of unusual flying objects. Do you seriously believe that nearly all witnesses are trying to tell their stories, for whatever reason, when nearly all of them stand to gain nothing but possible ridicule? Obviously some people write books on the subject, yourself included, but ordinary folk do not. They still make their reports. Do you sincerely believe they are all delusional? If this is so, what do you think would be the cause of this? Whether all these objects are hallucinations or apparent nuts and bolts craft, something is causing their manifestation. Read my FAQs. People see things in the sky they can’t explain. 95% of them can be explained. There is no evidence that the remainder are supernatural or extraterrestrial in origin. We don’t need to jump to such extraordinary explanations – there are plenty of ordinary ones. The vast majority of people who see UFOs are not lying or delusional. But there are people who lie and there are hallucinations and often these types of stories make the biggest impact upon public opinion, especially when promoted by the press and the UFO industry. Watch the Citizen Hearing on UFO Disclosure on youtube and make your own mind up if these guys were telling lies. Sorry wrong link supply above. This is the correct one. I’m an academic like yourself and have followed some of your work with interest. This isn’t about Rendlesham, just a general question. I haven’t, however, read your book, so pardon me if it’s answered there. Watching you on the television, I have to admire your research, your command of argument and even your sincerity. But I wonder: do you think any UFO/UAP event is genuine? Looking at the big picture, don’t you give any credence whatsoever to the tens of thousands of witnesses? Can they all be mis-perceiving strings of coincidence? Or do you still hold open just a tiny space of imagination that suggests there might be a mysterious and concerted activity going on? Hi Jeffrey (if I may)…the answer is quite simple, yes of course there are all sorts of mysteries that remain unsolved. That’s a given. What I don’t quite understand is the question about UFO/UAP events being ‘genuine’. A misperception of an ordinary object as an extraordinary object is still a genuine experience, whatever its source. It is the interpretation of the experience, by media and UFOlogists, that I question. Well, that goes without saying.How about the rest of my question? Do you find any of the thousands of reported sightings as being of objects that are possibly extra-terrestrial or from another dimension? Or do you feel that all of the sightings over the past 60 years are mis-perceptions of ordinary phenomena? I assure you that I too think that probably 90% of the reports are hoaxes, mis-interpretations of ordinary phenomena, etc. But in some cases there are highly credible witnesses, concomitant radar confirmations, and physical evidence. So in some cases, I think we are dealing with some force outside of everyday reality. Would you agree? Thank you very much for your reply. I am, by the way, properly envious of your position at the National Archives. I’ve been teaching a seminar on the paranormal for the last five years, so my interest in the phenomena is legitimate and, I hope, fairly objective. I think this answers all your questions! And the source of this information is? ‘…it was said to have been loaded with something’ sounds like hearsay. Said by who? Yes but the fact it appears in a book does not make it a fact. Who is the source of this information and how reliable is the source? Ian Ridpath (the well known UFO sceptic) in his attempted dissing of the Halt memo, said that Charles Halt was wrong when he said that Orford Ness Lighthouse was 30 degrees to the right of the farmhouse. If you check the positions of both on the map, you will see that Halt was correct. 04:00 hours. One object still hovering over Woodbridge base at about five to ten degrees off the horizon, still moving erratic and similar lights and beaming down as earlier. As Woodbridge Base was by now, in his position, to the West of him, how could the object have been the Lighthouse which was in the opposite direction? Great breakdown of the event. But what about the civilian witnesses off base that saw the lights descent into the forest? No one ever mentions this in skeptical analysis do they? Also the other witnesses from woodbridge base pre 1980 that saw strange activities in the forest and the sky… The whole area of the Suffolk coast has been noted for aerial phenomenon over the years. Even as recent as 2017 (hosley) village 6miles North of rendlesham… I live locally and and I have met many people associated with the bentwaters woodbridge ufo case and I do truly believe that something strange happened in December 1980 and they still happen…. The truth is that there were radar contacts over the three nights. I know this to be true. The evidence has been deliberately distorted by upper ranks. The lies about this and other sightings are themselves an indication that there is a need to hide the truth. I’ve studied this case extensively over the years and not once, have radar contacts been mentioned, not even by USAF personel present. If you know this is true, lets see the evidence, otherwise people might assume it’s just another embelishment to keep the story alive. Actually RAF Watton did not detect any unidentifed radar returns. We know this because the radar controller’s evidence is preserved in the MoD file. I interviewed him in 2002 and he has appeared on BBC Radio4 to confirm this fact. He recalls being called by Bentwaters tower to provide confirmation of the sightings by USAF personnel *as they were taking place* in the forest. He checked the radar picture and could see nothing. As this took place in the UK the Air Defence radar was RAF controlled – therefore this negative information is definitive. Problem is they did not report this at the time – they waited 30 years to come forward and were prompted to do so by TV programmes and media reportage. This is poor evidence for anything other than the will to believe. Still though, the eye-witness testimony of Halt, Penniston & Burroughs is pretty impressive, hard to deny and inexplicable by any normal means, will to believe or not. I think you will find that ‘eye-witness’ testimony is the least reliable evidence there is. Speak to any police officer, court official or lawyer about people’s testimony when it comes to witnessing crime, accidents, etc. In this case we are talking about something seen fleetingly at night in a dark forest. And some of the ‘testimony’ is filtered through 40 years of immersion in UFOlogy, TV programmes etc about aliens. Even in the original statements made in 1981 at Rendlesham we have completely contradictory testimonies from all the main players, e.g. Penniston says he saw a craft but Burroughs saw only lights etc. Those contradictions are present in the statements even a few days afterwards – so after 4 decades any reliability is fatally flawed by the processes of human memory and shared information. Halt can’t even get the dates of the occurrences correct in an official report to MoD. I cannot understand how any of this can be described as ‘pretty impressive’. No, it’s not impressive in the least. It’s tedious, flaky, and unconvincing. Halt comes across as a fantasist with no critical thinking abilities whatsoever, and Penniston, a liar & a fraud. In 2010, 30 years after the alleged incident, Penniston produced a notebook with handwritten binary numbers inside. He had somehow neglected to mention this evidence for the previous three decades. He revealed this was a message to him from time travelers from the future. He should have asked his temporal buddies to look into their time-tunnel and predict what sort of benefits he would gain from periodically embellishing and selling a nonsense story to the UFO circuit. Well you’re all entitled to your opinions but I find the witnesses to be very believable, they come across as being very honest and genuine, and I personally know for a fact that UFOs do exist as I have seen one. There is no doubt in my mind that we are being visited by entities from other worlds or other dimensions.